The Best Card Control in Magic! "The Selenium Shift is the ClipShift of this generation. The best control I've seen so far hands down." "If you think the control is fooling, wait until you see the applications. One of the most convincing controls out there." A move that allows you to control a selected card, anywhere in the deck, to the top. This shift can also move multiple cards, at different depths in the deck, to the top in a blink of an eye. No breaks. No passes. No disturbing the deck order. It's silent, invisible and oh ya... it's all done one handed. 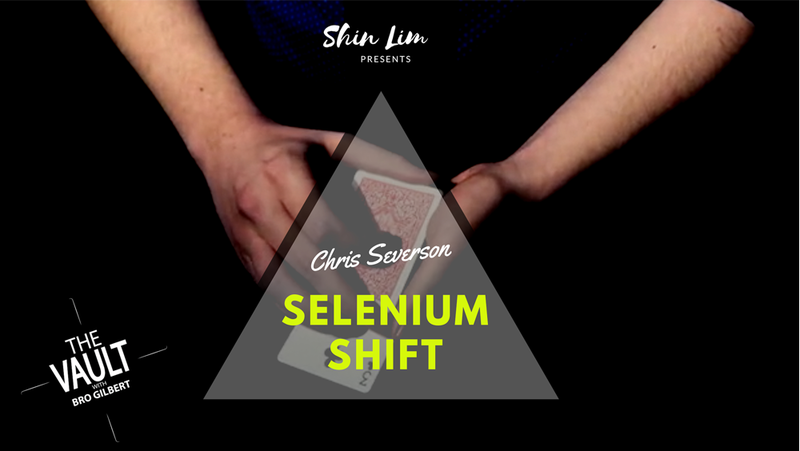 The Selenium Shift is taught in an over-the-shoulder angle, giving you the best learning experience and an understanding of how the move is done. - Multiple Shift: Four selections go into four different parts of the deck, and as they are squared up, they instantly appear on top! - Cover Shift: A selected card is squared into the middle of the deck, and is instantly underneath the top card. - Instant Sandwich: A signed card is pushed into the center of the deck and instantly sandwiched between a pair on top of the deck. - Rising Card: A selection is placed face up in the lower part of the deck, and if by magic, the card jumps up through the deck, until it reaches the top. - One Handed: A card is placed in the deck and as soon as you look away, it appears on top of the deck, one handed, with no cover. - Pseudo Center Deal: 4 aces go into the center of the deck, and you effortlessly deal them out onto the table! - The Full Routine: Schizophrenia: A signed selected card routine that has 3 color changes back to back, and inverted deck, ending with a FULL deck color change. All happening in 10 seconds. - Color Change: A buttery color change that just melts one card into another. - Card Vanish: A face up card instantly vanishes on the deck with no movement. In addition, there is also a companion book that teaches another Eight techniques, ideas, and handlings in full detail, with over 50 photos to help you learn. "The best control that I've seen." "The BEST card control that I have EVER seen!" "Upon learning the technique, I was amazed that this could have ever worked. It has become a favorite move, one that I know that I can always fool myself with in a mirror that I can't stop smiling at." "This is by far the sexiest shift I have ever (not) seen! I love this move!" "*Casshan died... seriously. He dead." "This is as fun to do as it is to watch!" "Is that what's going on?! I can't see you do a thing." An absolutely great trick. My problem is that it's much too difficult for me to master. I'm sure most other people would have the same problem, but maybe not. Q. Hi, I am wondering what the skill level is on this. Is it easy to learn or something that will take a lot of practice? A. This is rated as an Intermediate skill level and will require practice. Q. Are any gimmicks necessary to do the routines?